England has as much chance of winning the FIFA World Cup as Germany and France, according to sports data consultancy 21st Club. The data-based prediction – which takes into account factors from goals to red cards for every international match played – give England a five per cent chance, below favourites Brazil (by far the favourite at 32 per cent) and Spain (17 per cent – although this analysis was completed before what some are calling the worst crisis in the history of Spanish football), but much higher than many pundits are predicting. The data shows that England can significantly improve its chances of winning the competition if the team gels as the tournament progresses. This might be a fairly obvious point to make, but comparing England’s performance as a team against a prediction model based solely on individual player ratings — 21st Club assesses players according to their club, playing position, minutes played, goals, assists, and plus-minus contribution (a sports stats that evaluates a player’s impact on the game) — it’s clear that the Three Lions are an exemplar of a team that’s noticeably worse than the sum of its parts. “The idea here is that we have a pretty good idea of how good Brazil are within South America, because they play a lot of matches with other South American nations, and a pretty good idea of how good Mexico are within North America, because they play a lot of matches in their continent,” says Luis Usier, a quantitative analyst at 21st Club. 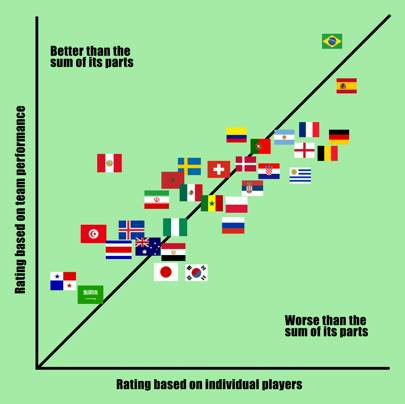 “Then, when Brazil play Mexico, we are able to estimate how good they are to each other.” Based on player-ratings, the 21st Club model gives England an eight per cent chance of winning the World Cup and 18 per cent chance of reaching the final (versus ten per cent for the team-based prediction). 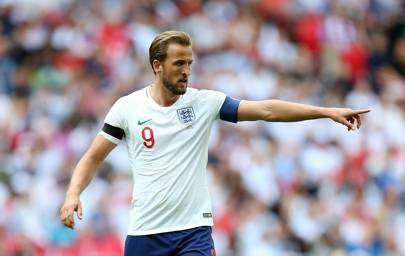 Team cohesion was something that was notoriously absent in recent tournaments for England, but with a team replete with young talent — Harry Kane, Delle Alli and Raheem Sterling — under manager Gareth Southgate’s more assured and self-aware management style, there’s leeway for significant improvement. “Given the talent available to manager Gareth Southgate, it wouldn’t be a surprise if they improved during the tournament as the players got used to playing with each other in their national team roles,” says Usier. Other teams that are noticeably worse as a collective are Belgium, France, Belgium, Spain and, surprisingly, Germany. Of course, it will be difficult for any team to beat uber-favourites Brazil. According to the 21st Club model, Brazil have a 32 percent chance to lift the World Cup for the sixth time in the history of the competition. The team arrives in Russia with outstanding players like Neymar, Gabriel Jesus, Marcelo, Casemiro, Coutinho, who have thrived under coach Tite. “They have been great in the two years leading up to the World Cup, winning 17 out of 21 matches and outscoring their opponents 44 goals to 5 during this time period,” Usier says. The big question for Neymar and company is whether they have put the trauma of the previous World Cup firmly behind them.